Kate Reeve's Chem 3U Blog : Unit 3 - Airbags: Friend or Foe? Welcome back! In Unit 3 of chemistry course, we delved into the exciting world of stoichiometry, mole calculations, percent composition, percent yield, and all sorts of other new ways to calculate stuff. Today we're going to discuss a real world application of stoichometry (quantities in chemical reactions) and take a look at why this stuff matters outside a lab. Airbags save thousands of lives each year in the States and here in Canada. But even after more than 2 decades after they've become mandatory in most cars, the auto industry still struggles to master the complex systems that must work flawlessly in less than a second. The recent recall of Takata air bags and General Motor's recall of their ignition switches highlights the problems that can occur when airbags actually deploy and when they don't. Airbags are known for being extremely delicate and complex systems. The bag itself is made of thin nylon, which is folded into the steering wheel, dashboard, seat, or door. The sensor, typically located inside the dashboard, tells the device when to inflate. This happens only when the sensor detects collision force equal to running into a brick wall between 16 - 24km/hr. When this occurs, the airbag system ignites a solid propellant (similar to a rocket booster), which burns very quickly to produce huge volume of gas (ammonium nitrate). The gas then fills the nylon bag and literally bursts from its storage place into the vehicle at over 200mph. Takata airbags, found in many new cars on the market today, have been recently recalled after new evidence came to light about the dangers they pose to drivers and passengers. Over 100 injuries and 5 deaths have been due to the airbags, who send metal shrapnel flying when deployed. Despite extensive research, a single cause has not been identified. Some suspect the ammonium nitrate itself, only recently used in their airbags, and hailed as a "new technological edge" by a company engineer (Paresh Khandhadia, 2009). According to experts, ammonium nitrate breaks down over time and is very sensitive to temperature changes and moisture. Under these conditions, they say, it can combust violently (Hiroko Tabuchi, 2014). Interestingly, it becomes unstable at about 100 degrees. The inside of a car in summer may get as warm as 140 degrees! But it's cheap. Unbelievably so. Some say the switch from sodium azide (as seen in the inflation device diagram) to ammonium nitrate in 1998 was not for cost reasons, but for the environment. Ammonium nitrate produced gas much more efficiently with fewer emissions in their trials, says Alby Berman, a spokesperson for the brand. Either way, the company continues to use ammonium nitrate in their replacement air bags. Another theorized issue is the quantity of ammonium nitrate involved in the equation. 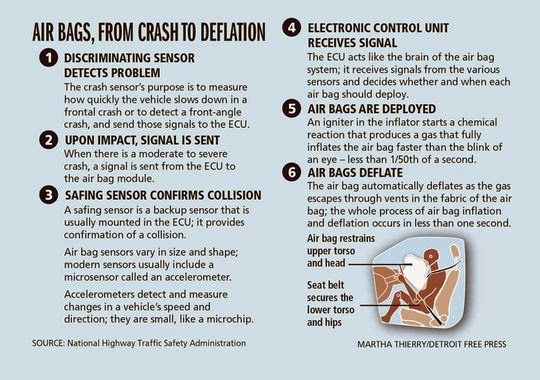 The New York Times published a video in 2014 depicting scenes of dropped air bag 'kits' and other mishaps on the assembly line. Sources who wished to remain anonymous told the newspaper that there was such enormous pressure to keep with demand, that sending potentially defective or damaged product back was not popular with management. If the amount of ammonium nitrate varied even a little from bag to bag, this could severely impact the resulting chemical reaction. As studied in stoichiometry, a change in the amount of reactants can completely alter the reaction itself. These unknown changes are not something you want coming at your face or your family's faces at 200 mph. In my opinion, Takata is playing with fire. Using ammonium nitrate may be cheaper and 'produce less emissions', but at what cost? It seems almost crass to continue using the compound when it may or may not be involved in many deaths and injuries. Personally, I'm grateful neither of my parents cars use Takata airbags. Even though we've never been in an accident, it's still much better to know we won't have shrapnel coming at us inside our own car. I hope as much effort as possible is put into researching the cause of these malfunctions and correcting it. At the very least, ensuring quality product off the assembly line is a good first step. 1. Do the benefits of ammonium nitrate outweigh the costs, in your opinion? After all, they don't ALL explode. 2. Should Takata have recalled only the airbags from cars registered in more humid/warm cities? Why or why not? 3. Compare sodium azide to ammonium nitrate. Why is sodium azide purportedly safer? 4. If you could give a piece of advice to the CEO of Takata, what would it be? Hey KR! This issue is so frightening/annoying! If I could give one piece of advice to the CEO of Takata it would be to think about his/her own family members getting injured due to a terrible decision of his/hers. Airbags are absolutely crucial components of vehicles and save tons of lives when properly used - I'm assuming many people would not even drive a car that didn't have airbags. I know if I drove a Takata vehicle and read this article, I would immediately tow it to the nearest dealer and demand a refund. Why take the risk? This leads me to an answer of one of your other questions. No, the benefits of ammonium nitrate do not outweigh the costs. In this day and age, with the amount of technology we have, I refuse to believe that car companies cannot come up with an environmentally friendly and incredibly safe airbag. If you asked any new parent, I'm sure they would prefer their money to go to a working airbag rather than a sleek new design/colour. Big companies like Takata should recognize that and lead the safety charge in the future. You know, this is kind of ironic if you think about it. The airbag, which is supposed to save your life in bad situations, actually ends up injuring/killing you. But yeah, if I met the CEO of Takata, I’d tell him/her to not sacrifice product quality for price/nature. It’s important to save the trees, but I don’t think that we should prioritize nature over people. I also understand that switching to ammonium nitrate helps the company make a profit, but is a profit really worth the lives of five people? Besides, airbags are meant to keep people safe, and if people hear that hundreds of Takata airbag owners got injured, and some died, many would rush to replace them. I know I would, at least. As for the instability of ammonium nitrate when over 100 degrees, that just seems like plain negligence to me! Do car manufacturers not know the average temperature of cars? How could you justify making an extremely delicate, not to mention dangerous even in the best of situations, out of an unstable gas? Ugh... I know airbags save lives, but all I seem to hear about them is horror stories. Oh well. This was helpful, now I'll be sure to do careful research when picking a car later in life.